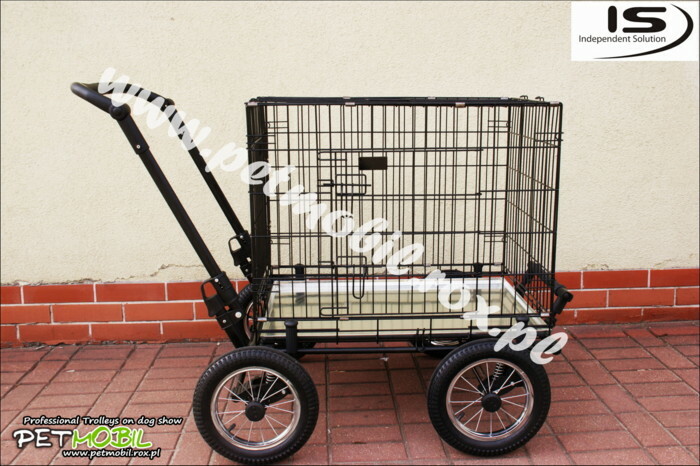 PetMobil Standard M - trolley with cage - Trolleys on dog show. 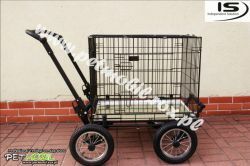 Present you a PetMobil complete "M" with a silver cage in size 78cm length x 55cm width x 61cm height or with black cage in size 76cm lengt x 54cm width x 61cm height. Galvanized cage has a pair of double doors. Steel. The set includes: trolley, cage and the top cage The trolley is made from best quality materials. It has three shock absorbers front and rear brakes, wheels, pneumatic (pumped), easily beats any terrain. All trolley frame is painted with powder method that is very permanent. Weight trolley the load up to 50kg. The entire trolley is folded, you can also take off the wheels. Folded trolley has a height about 32 cm after take off the wheels 27 cm. While the width is equal to the width of the frame. Cage also can be folded. PetMobil this is it!